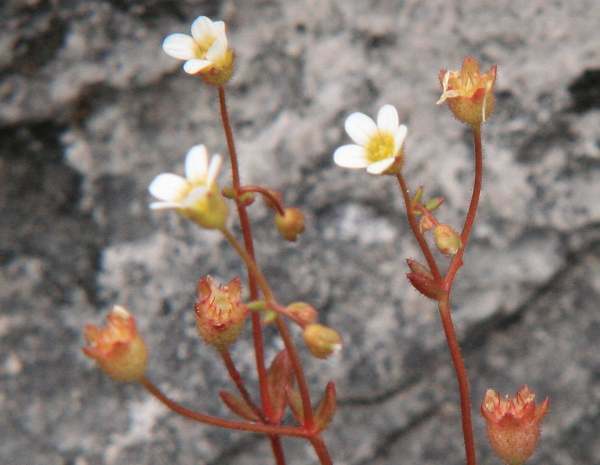 Saxifraga tridactylites is an annual that grows to a height of around 15cm and has small clusters of white fflowers each typically 5-6mm across and havi9ng five petals backed by green sepals about half as long as the petals. The zigzag stems and leaves, both of which are distinctly (and often brightly) reddish, are the defining features of this plant and set it apart from other saxifrage species that are native to Britain and Ireland. Rue-leaved Saxifrage usually flowers from June to September. This plant grows in bare, dry locations, on the tops of walls and in sandy, rocky soils which are calcareous. 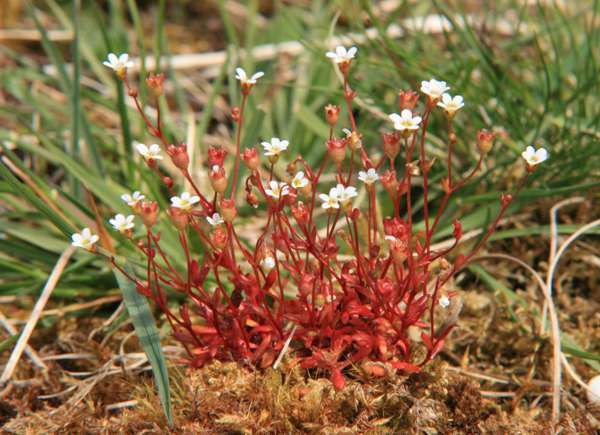 Rue-leaved Saxifrage is locally common and widespread throughout England, Wales and Ireland. We have seen this attractive little wildflower in The Burren in County Clare in Ireland and also in Craig y Cilau National Nature Reserve on the southern edge of the Brecon Beacons in Wales. The specimens shown on this page were photographed in The Burren in June.